Most VHF/UHF contesters prefer high gain yagis. Since we (at DL0YE/p) did not want to use an antenna rotor we needed an array with broad frontlobe, clean pattern, high gain and high front/back ratio. A simple dipole offers main lobes of about 70 degrees (-3dB) beamwidth. Adding a reflector element provides some gain but only medium front/back ratio. 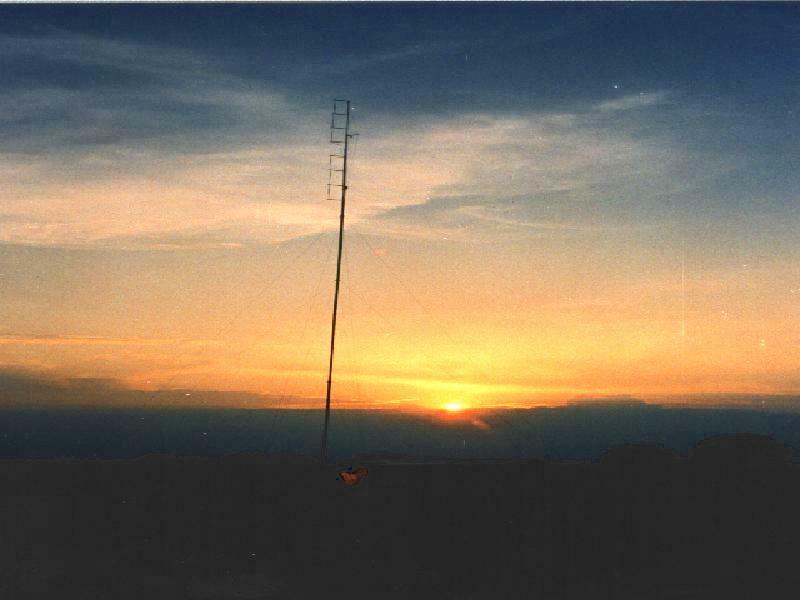 Stacking of eight 2-element antennas increases not only gain but a lot of front/back ratio. Optimal gain occurs at stacking distances of about 0.9 lambda. Simulations with MININEC showed that it is impossible to achieve sufficient front/back ratios at this distances with simple 2-element antennas and feed-impedances are very low. Therefore I chose a stacking of 0.5 lambda. At this distance the front/back ratios reaches more than 30 dB (theoretically). This stacking offers a well known simple phasing technique. All elements can be fed in parallel by open wires provided that they are fed in phase. This can be achieved by twisting the open wire phasing-lines at 180 degrees. Wiring 8 antennas in parallel decreases the common feed-point impedance to 1/8 of a single antenna. So I considered to choose folded dipoles as driven elements. Since a folded dipole has some self-balancing characteristics I did not need any balun or gamma matches (for detail see figures). After hours of simulations with MININEC I got a final design that provides more than 13 dB gain over dipole and more than 30 dB front/back ratio even with very thin elements made of medium conductive stainless steel. Choosing brass or copper did not increase performance markedly. Reflector spacing is 0.15 lambda for maximum gain versus assumed loss resistance of about 1 Ohm (KRAUS, ANTENNAS, 1988, p. 546). The phasing lines are made of well known 450 Ohms windowed ladder line. This line has an outstanding low loss even at 144 MHz running at high SWR. I calculated the overall feeding loss at <1 dB. This is hard to achieve with coax feed using power dividers (at higher costs...). All eight short booms are made of wood 400 mm (15.6 inches) long. Elements are mounted through wholes drilled 0.1mm smaller than element diameter (2mm). The feed-points of the folded dipoles are hold in place and insulated by small blocks of polyethylene. The antennas are mounted in front of an aluminium mast (height: 7 meters, 23 feet) with muffler clamps. The main feed-point is between the forth and fifth level using a matching section made from two pieces of 450 Ohms ladder line. The 50 Ohms coax is soldered to it´s parallel connected ends without any balancing unit. Using the matching section described above I found a SWR lower than 1.2 from 144 MHz to 144.5 MHz. Even at 146 MHz the SWR does not rise over 1.6. Minimum SWR was measured at 144.2 MHz (<1.1). This was found at different points of the coax cable at any lengths (RHODE&SCHWARZ-Powermeter). Front/back ratio was measured with a Drake R4c receiver with VHF converter listening to some strong and weak signals. I found substantially more than 25 dB. Pattern is, according to MININEC simulations, very clean and no asymmetry could be found. This showed the self-balancing effect of folded dipoles. Side minimum was found lower than 50 dB at both sides. Vertical polarization leakage stemming from unwanted radiation of unbalanced phasing lines was about 20 dB down, measured by tilting the whole system from horizontal to vertical polarization. Gain measurements were made by comparing the antenna to a simple dipole. I found levels varying from 2 to 3 S-units on the R4c S-meter (10-15 dB gain). Some notes : My first choice was a trumpet shaped geometry of the matching section. Since this showed a very narrow bandwidth I made some variations. The final and best geometry was }-shaped as shown in Fig.3. This can be hold in place by strings. Important is the overall length of the two matching lines compared to the length of the short tight section at the connection to the coax line. Altering the ratio between open and tight section makes the final match. Hold the matching lines well off any supporting structures! We mounted the whole system on top of a surplus military 17m mast and found it of outstanding performance under all contest conditions.